The jacket has a clean chest, with very padded, but narrow, shoulders and roped sleeve heads. It has a traditional 3-button front, with only the middle button fastened. It is cut with bi-swing shoulder pleats to allow the arms more movement in sporting activities. The pleats expand when the arms are extended forward. High armholes also help with the range of movement. The long double vents below echo the shoulder pleats. The jacket has 3-button cuffs and slanted hacking pockets with flaps. 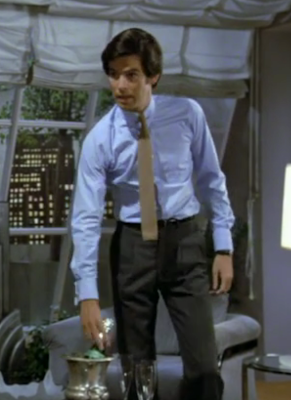 Brosnan wears charcoal trousers with double reverse pleats. The light blue poplin shirt has an American style, very different from what James Bond wears. The biggest difference comes in the collar, which here is a point collar worn with a collar bar (the kind that slides onto the collar). Point collars are more conservative in America than the English spread collar, and collar bars saw a surge in popularity in the 1980s. The collar also has modern edge stitching, as opposed to the more traditional stitching a quarter-inch from the edge. Two other parts of the shirt identify it as American: the breast pocket and the box pleat on the back. 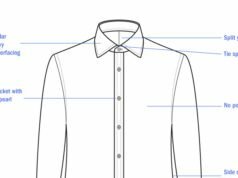 The shirt is very fitted trough the body, which might suggest it was custom made, though most custom shirt makers avoid the box pleat on the back because it is practically useless and typically ends up looking sloppy. It’s possible that it was bought off the pegs and altered. The shirt has double cuffs; Remington Steele always wears cufflinks. A tan knit tie picks up the tan windowpane in the sports coat. It’s a very fine knit and not made of silk. It’s probably cotton and/or wool. The brown silk pocket square also brings out the tan in the sports coat and complements the tie without matching it. Brosnan wears a black belt and black shoes with this outfit. I love the sports coat that he's wearing. It just makes me upset thinking that I don't have something like that in my collection, is that one some kind of vintage? The style died out during WWII, but it came back in the 1970s. Typically it is seen with a single vent due to it's sporting applications, but I much prefer the way that the double vents echo the shoulder pleats. Polo Ralph Lauren often offers such sports coats, and they can also be found at some stores that sell traditional sports wear. Thanks for including this. I study Remington Steele carefully for the writing but know very little about clothing design. This is very interesting to me. 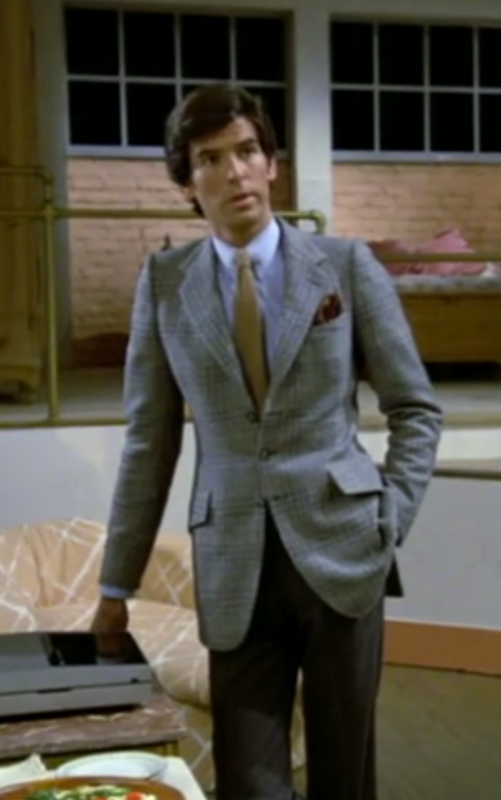 I wonder if you have noticed in your viewing that starting with the second season of Remington Steele clothing color is often used in a symbolic way. Brosnan wears blue shirts of a certain hue when the plot is concerned with Steele's "true" identity. Several characters wear purple when the plot calls for outright deceit in the course of an investigation. White, black, red, pink and yellow/green all seem to have symbolic meaning in the clothing depending on who is wearing the color in what plot circumstance. The second season opener, "Steele Away with Me", seems to set up the color symbolism, and it carries through the fourth season in many (but not all episodes). Any thoughts on color symbolism in the production? he really had narrow shoulders!!! In the first picture you can see where his actual shoulders are and where the jacket's shoulder padding takes over. Padded shoulders were very popular in the 1980s, though typically they were wider. Pierce Brosnan's sloping shoulders needed more padding than usual to give him the presence the character required. The jacket's shoulders are actually about an inch above Brosnan's shoulders. I’m just not mad about the shirt collar style. For me, the spread collar, without a breast pocket, looks more elegant. I have a gold colour Polo Ralph Lauren corduroy jacket like you refer to with patch pockets and half belt at the back (kind of Half-Norfolk jacket). 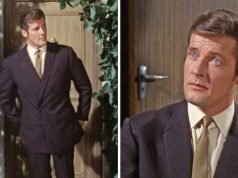 The back of the jacket has a single vent below a half belt and shoulder pleats (like Moores Spy Who Loved Me sports coat he wears in Egypt) and the lapel has this little flap appellation with a buttonhole (designed to connect across to a button hidden under the opposite lapel). 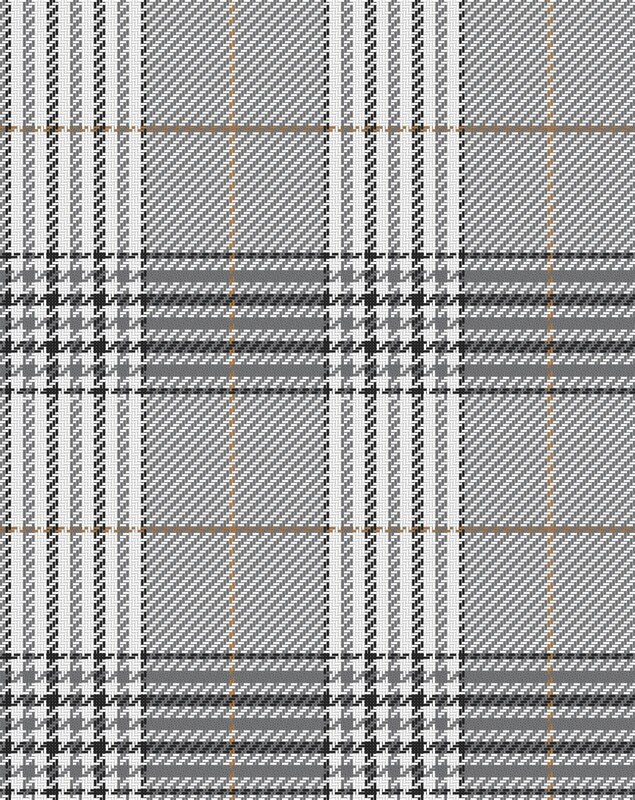 Often featured on sports coats, do you know the name for it? 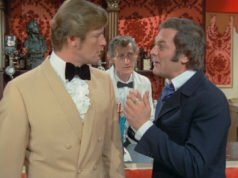 The other TV show where I have seen a lot of sports jackets (corduroy, wool and tweed) with back shoulder flaps (but wider lapels) featured was the brilliant “Streets of San Francisco” from the 1970’s. Michael Douglas’ character wears some of these. 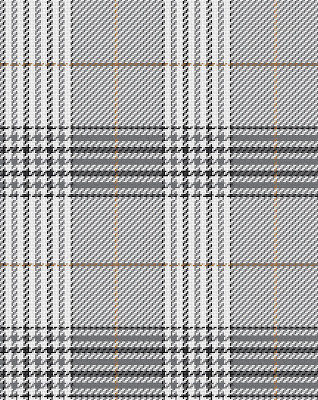 Bookster, which makes and sells tweed sports coats, call it a collar tab, though the ones they make are extended from the collar, not attached with a separate tab. They may also be called a throat latch. 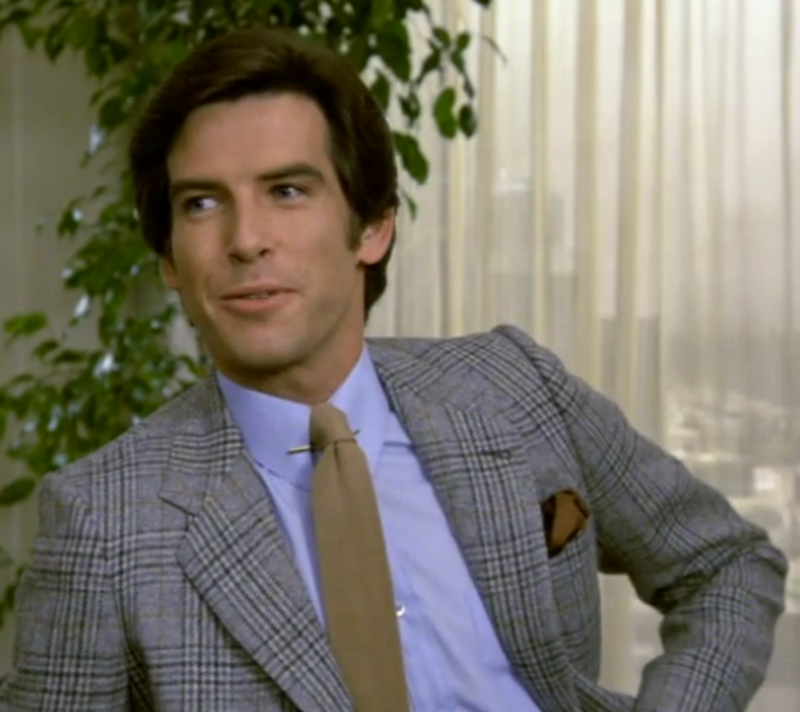 Brosnan wore a few sports coats with collar tabs in the first two seasons of Remington Steele.